Espurr the cat and Growlithe the husky have some very unusual habits. We all expect cats to turn and run when a much larger dog invades their space, but in Julia Juran’s garden, the tables have turned. This footage shows a grumpy Espurr start to chase her canine friend. Growlithe had been pestering the cat to play with him so she decided to chase him off. In today's world, your husky can't find work as a sled dog, but he likes to play as hard as his ancestors used to work. A Siberian husky is a highly active, medium-sized, muscular dog with high prey drive. For your skeptical kitty, that normally means when Fluffy moves, Tundra pursues. Some huskies may never be able to live safely with a cat, but with proper introduction and training, some can. Alpha Cats: They are natural leaders; they refuse to be led and attempt to take charge of practically every situation. These cats like their food when they want it and the way that they like it ... or else. They may only let you touch them for short periods of time and then again, only on their terms. They rebel when admonished and demand attention, access, and assets - when the mood so takes them. You don't own an alpha cat – he owns you, or at least, he thinks he does. Responses to "Who is the Boss? 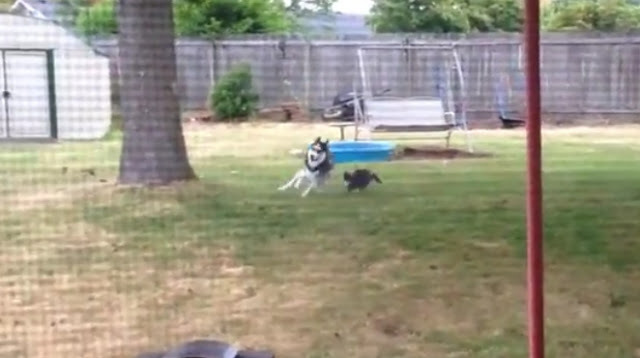 Small Cat Chases Big Husky Dog"
Hate to say this but there is something wrong with the husky. His back end wanted to go out from under him or he was ready to pass out. Hope the owners saw it. He looked a bit wobbly after he ran himself half to death but other than that he looked ok. I always like the way they try to tuck their bums in thinking they won't get nabbed when all it does is slow them down. They are just playing together, thats not a chase as the headline suggested. If it were, the cat would have hiss or meowled at least once, but never did. Where did you get the great fire pit?